Visit the Cresco Labs Investor Dashboard and stay up to date with data-driven, fact based due diligence for active traders and investors. Third quarter revenue1 of $12.2 million, up 335% year-over-year and 51% quarter-over-quarter. Year-to-date revenue of $25.1 million, up 248% from the prior year. Third quarter pro forma revenue2 of $16.3 million and year-to-date pro forma revenue of $35.1 million. Third quarter net income of $3.9 million, compared to net loss of $0.2 million in the prior-year period. Third quarter adjusted EBITDA3 of $5.3 million, compared to adjusted EBITDA of less than $0.1 million in the prior-year period. Successfully raised $205 million in growth capital through three capital raises in 2018. Operations in seven states, with binding transactions pending in two more states. 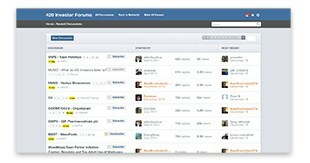 Deepened and strengthened management team through numerous key hires from Fortune 100 and other major companies. Hired more than 400 employees in 2018, bringing total staff to nearly 500 employees. 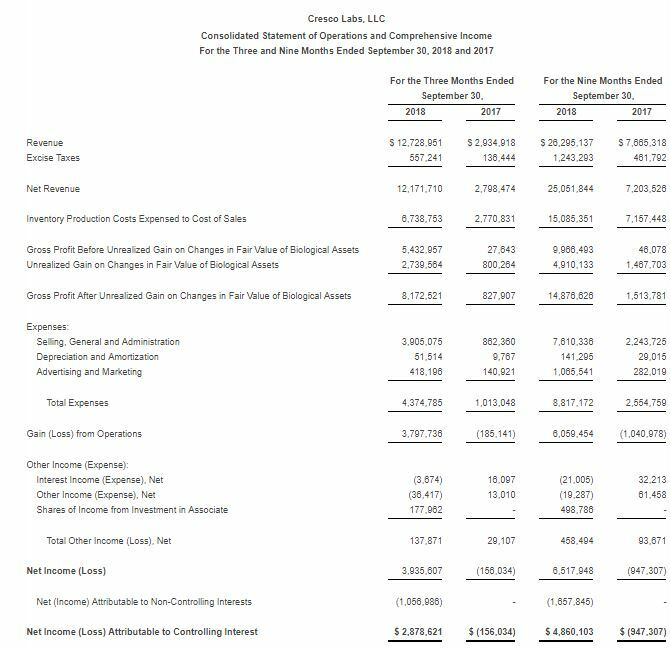 CHICAGO–(BUSINESS WIRE)–Cresco Labs, Inc. (CSE:CL) (“Cresco” or “the Company”) one of the largest vertically integrated multistate cannabis operators in the United States, today released its financial results for the third quarter and nine months ended September 30, 2018. All financial information presented in this release is in U.S. dollars, unless otherwise noted. Subsequent to the end of third quarter 2018, the Company completed a business combination with Randsburg International Gold Corp. upon which its subordinate voting shares were approved for listing on the Canadian Securities Exchange (“CSE”) under the symbol “CL.” Cresco’s shares began trading on the CSE on Monday, December 3, 2018. The Company is in the process of receiving approval by FINRA to list on the OTC market in the U.S. and is currently trading under the symbol “CRLBF.” Concurrent with its public listing on the CSE, Cresco launched its new investors website at investors.crescolabs.com. 1 Revenue presented in the text herein is calculated net of excise taxes. 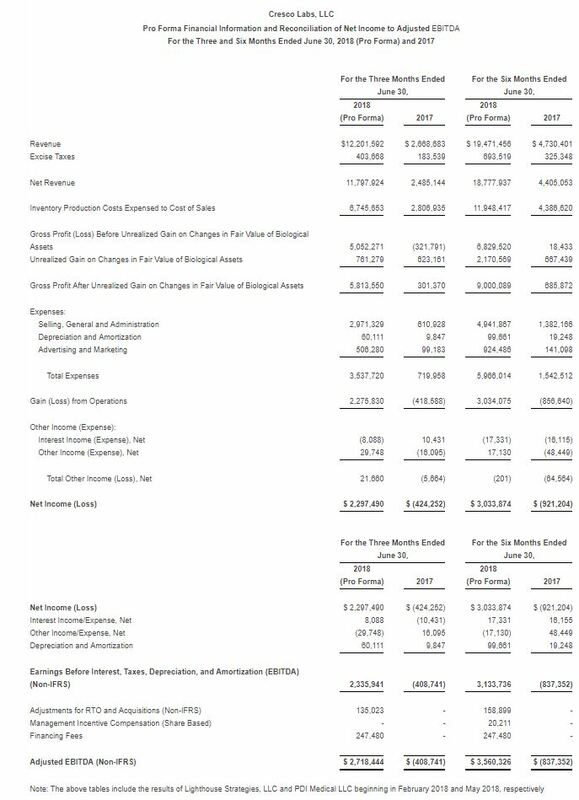 2 Pro forma revenue and adjusted EBITDA information reflect consolidated results of less than majority owned affiliates. 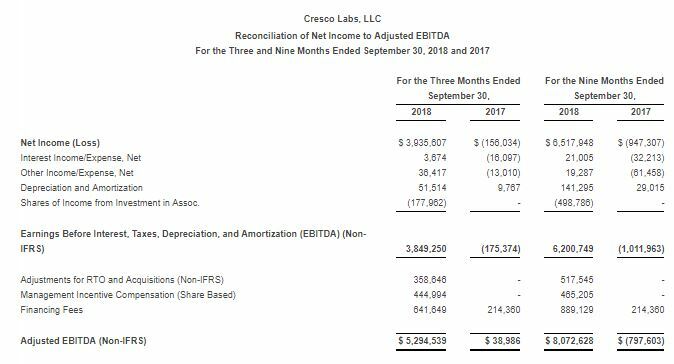 3 See “Non-IFRS Financial Measures” at the end of this press release for more information regarding Cresco Labs’ use of non-IFRS financial measures. “As one of the early cannabis companies to establish a national geographic footprint with substantial population reach and production capacity, Cresco is leading the way in normalizing and professionalizing our industry,” said Charles Bachtell, Co-founder and CEO of Cresco Labs. “As a multi-state operator (“MSO”), we have repeatedly proven our ability to get access to markets, get operational, get product to markets, and get disproportionate market share. Early on in our formation, we realized that cannabis is a natural fit within consumer-packaged goods (“CPG”) – an industry that requires consistency, reliability and availability. We therefore developed a unique and sophisticated ‘house of brands’ that addresses each major market segment and covers all price points. In essence, we developed a disciplined business blueprint that enables our rapid entry into regulated markets, where operator obligations are stringent, where our products can be accessible to customers, and where we can capture leading market share right from the start. Through our differentiated business approach, we have already proven that our capital starts working immediately to the benefit of our shareholders, regulators, legislators and consumers. Now, with increased access to the capital markets through our public listing, we can take our expansion strategy to the next level. We believe that Cresco has built the foundation needed to generate strong growth and attractive shareholder returns in the years ahead. Revenue for the third quarter of 2018 was $12.2 million, an increase of 335% compared to revenue of $2.8 million for the third quarter of 2017. The increase in revenue was driven by market expansion and gains in market share in the states where the Company operates. Third quarter revenue increased 51% compared to $8.1 million for the second quarter of 2018. On a pro forma basis, revenue for the third quarter was $16.3 million compared to $11.8 million for the second quarter of 2018, an increase of 39%. Third quarter gross profit, before the gain from biological assets, was $5.4 million, or 45% of revenues, compared to less than $0.1 million, or 1% of revenues, for the third quarter of 2017 and $3.5 million, or 43% of revenues, for the second quarter of 2018. Net income for the third quarter was $3.9 million, compared to net loss of $0.2 million for the prior-year period. Net income nearly doubled from $2.0 million for the second quarter of 2018. Adjusted EBITDA for the third quarter was $5.3 million, compared to less than $0.1 million for the third quarter of 2017 and $2.1 million for the second quarter of 2018. Pro forma adjusted EBITDA was $5.9 million for the third quarter and $2.7 million for the second quarter of 2018. 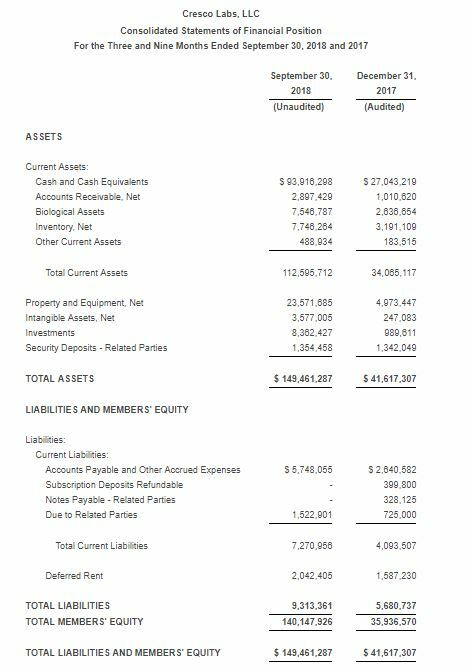 As of September 30, 2018, the Company had total assets of $149.5 million, including cash and cash equivalents of $93.9 million, which does not reflect the full amount of proceeds from financing activities completed subsequent to the end of the quarter. 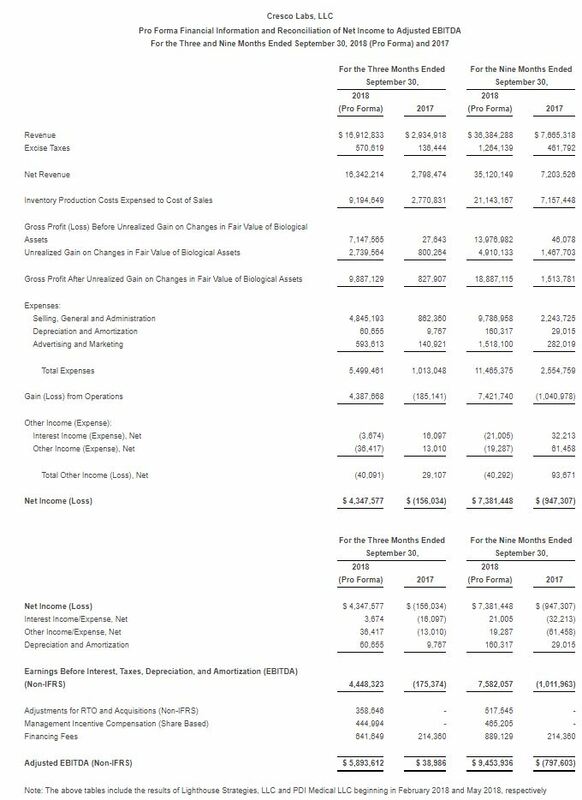 Long-term liabilities totaled $2.0 million. At September 30, 2018, the Company had a working capital position of $105.3 million. In October, the Company closed a $100 million Series F private funding raise, the second largest private funding round in U.S. cannabis history at that time. A portion of the round was funded in late September and a substantial amount was funded during the fourth quarter of 2018. Nevada: Launched Mindy’s Edibles and Mindy’s Kitchen with expansive distribution. Ohio: While the program has experienced slight delays, Cresco’s first harvest in Yellow Springs will take place in the fourth quarter and the Wintersville dispensary will be the first dispensary in the state to receive operational approval during the same period. Pennsylvania: Developing expansion plan of 75,000 square feet in Brookville cultivation facility including a new greenhouse that will increase capacity by four times. California: First harvest from seven-acre production site located along the central coast. Illinois: Doubled cultivation capacity and quadrupled production and manufacturing capacity across three facilities; added a sophisticated edibles kitchen. Illinois: Acquired 100% of the membership interests of FloraMedex, LLC and an affiliated real estate entity, including an operational medical marijuana dispensary in Elmwood Park. Illinois: Market growth in the state has been driven by an increasing number of registered patients and the recently passed Illinois Alternatives to Opioids Act which, when fully implemented during the first quarter of 2019, is expected to vastly expand the population of patients that can access medical cannabis in place of pharmaceutical opioid medications. Massachusetts: Acquisition of Hope Heal Health, Inc. (“HHH”) and an affiliated real estate entity with assets including state registration and licensing that will allow for cultivation, manufacturing, processing, and the establishment and operation of a medical marijuana dispensary, with the ability to obtain up to three medical marijuana dispensary licenses and three adult-use dispensary licenses. Arizona: Acquisition of Arizona Facilities Supply, LLC and certain of its subsidiaries, providing two cultivation facilities, one processing facility and one dispensary. 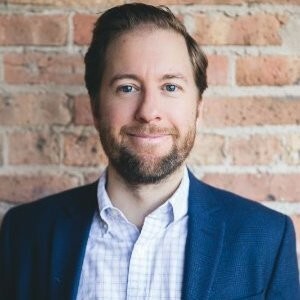 Co-Founder and CEO Charlie Bachtell was appointed to the cannabis subcommittee of Illinois Governor-elect JB Pritzker’s transition team. Bachtell is the only cannabis industry operator appointed to provide input that will shape the future of the cannabis program in Illinois. Cresco was named to the prestigious “Cannabis 100” list recognizing industry leaders and entrepreneurs by Green Entrepreneur, a division of Entrepreneur.com. Cresco was named among the best companies to work for in cannabis by MJ Magazine. Cresco was the first-ever cannabis company to win a national Healthcare Advertising Award. Cresco was also the first-ever cannabis company to receive a Summit International Award for creative, marketing and advertising. Chief Experience Officer: Scott Wilson, former global creative director for Nike. Senior Vice President of Product Development and Commercialization: Todd West, former Lifeway Foods executive. Vice President of Consumer Experience: Cris Rivera, previously a senior director of marketing for MillerCoors. Vice President of Brand Marketing: Cory Rothschild, former director of consumer engagement for Gatorade, a PepsiCo company. In addition to the above key hires, Cresco has recruited experts across every industry from companies including Stericycle, Abbvie, Abbott, Cushman & Wakefield, Pandora and BMO Financial Group. The Company will hold a conference call and webcast to discuss its business and financial results next Monday, December 17, 2018 at 5 p.m. Eastern Time (4 p.m. Central Time). The conference call may be accessed via Cresco Labs’ investors website at investors.crescolabs.com or by dialing 866-688-4235 (409-216-0711 for international callers) and entering conference ID 5047018. Archived access to the webcast will be available for one year on Cresco’s investors website. The Company’s unaudited consolidated interim financial statements and accompanying notes for the third quarter 2018 are available under the Company’s profile on SEDAR at www.sedar.com and on Cresco’s investors website at investors.crescolabs.com. 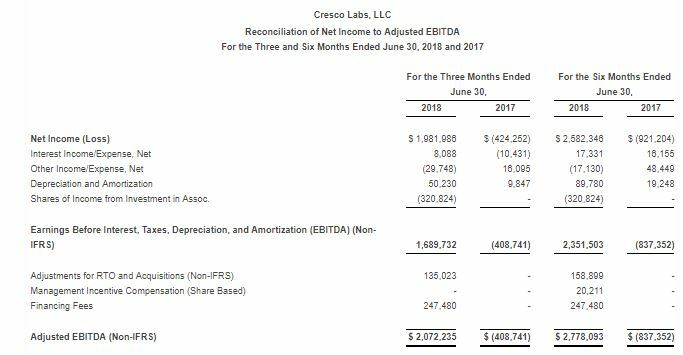 Cresco references certain non-IFRS financial measures throughout this press release, which may not be comparable to similar measures presented by other issuers. Please see the “Non-IFRS Financial Measures” section at the end of this press release for more detailed information. Cresco Labs, based in Chicago, is a leading U.S. cannabis company with experienced management, access to capital and a demonstrated growth strategy. As a differentiated grower, processor and retailer of premium cannabis operating in seven states, the company focuses on entering highly regulated markets with outsized demand potential and high barriers to entry. Its impressive speed-to-market gives Cresco a distinct competitive advantage as it replicates its model to expand its national footprint. Cresco’s proven ability to execute is complemented by a cutting-edge brand strategy spearheaded by several of the brightest minds in consumer marketing in the nation. Cresco’s products are tailored to all major consumer segments: everyday cannabis, medicinally focused, connoisseur grade, and chef inspired edibles by James Beard Award-winning pastry chef Mindy Segal. Learn more about Cresco Labs at crescolabs.com. The most reliable, fact-based information on Cresco Labs found only on its Investor Dashboard.